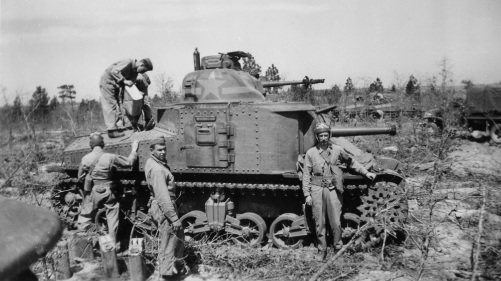 Below are links to some of the writing I've done over the years about the 751st Tank Battalion and other World War II topics. While I've tried to be as accurate as possible concerning the events described, some of my writing contains a certain amount of speculation on my part as to the motivations, emotions, and philosophies of the soldiers profiled within. This story explores the theme of death from the perspectives of two soldiers. While the story is "true" in the broader sense of the word, I have made some assumptions as to the thoughts and feelings of the men portrayed. My appreciation to Edwin Huss and Doug Neumiller of Sykeston for supplying some of the details of this story. In 2007, I was asked to speak in my hometown, Sykeston, North Dakota, at their American Legion Memorial Day celebration. This is the reading I gave that day. My thanks to Bourke-Hollingsworth American Legion Post #17. This piece was originally published in Carrington,North Dakota's The Independent, the closest thing the residents of Sykeston have to a hometown newspaper. While not mentioning the 751st Tank Battalion specifically, this short essay uses the metaphor of winter and the speculation on one photograph to examine the waning isolationist attitudes of Americans in 1940.